When you travel to a destination like Rajasthan, you expect to see its all-pervasive royal heritage everywhere. Most hotels and resorts have fashioned themselves like palaces and forts, even if they are newly built. Then, there are old palaces and forts that are now working as hotels and I call them living heritage. This time when Lebua Resort Jaipur invited me to visit Jaipur, I expected the same. As our car entered the Lebua Resort almost in the middle of nowhere, surrounded by fields and Aravalli hills, all I could see was the geometric shapes. Rajasthani musicians played the welcome music but the surroundings had a strange mix of contemporary sensibilities while still being rooted in the heritage of the Jaipur town. We stepped in and stood in the middle of a long, latticed tunnel like a lobby in a subtle pink color stone. Accentuating this was the bright pink of the furniture. No points for guessing you are in the Pink City of Jaipur. I admired the geometric lattice all around me. All this while sipping an Aam Panna, that I would look forward to every time I stepped inside the lobby. We walked into my room – I got the red room and I could not have asked for a better color. Well, this luxury room would keep me engaged in its geometry for the next 4 days that it was my home. As soon as you enter the jewelry of Shrinathji from Nathdwara welcomes you. The glass work panel runs zigzag from one end of the long room to the other. The bathroom was like dream come true – especially the sunken bathtub next to an open space with bamboos filling the empty space. Behind my bed was a mysterious painting of an Invisible Bride – with only her jewelry visible from a distance and a face revealing when you get closer. She for sure added an element of mystique to the room. My fellow travelers got a similar room in turmeric yellow and emerald green. Each room looks outside into the wilderness away from the eyes of other guests. In the morning I woke up to the chirping of birds. A staircase led to the private balcony and sit out surrounded by rooftop gardens. You look at the Aravallis in front of you. When you look back, you see the radial gardens all around you. The curve behind you makes its presence felt. Due to the curved shape of the building, each room is unique. We checked a few other rooms and were bowled over by a blue and yellow room with a large Jharokha style sitting. I was told Lebua Resort Jaipur is inspired by the geometry of Jantar Mantar – an observatory and the UNESCO World Heritage Site at Jaipur. It was after visiting Jantar Mantar that I could see all elements of it at play in the resort. The two curves of the main blocks are inspired by the Samrat Yantra. The ramp that connects the various floors looks like the triangular walls of the instruments. The round Chakra is inspired by the Kapali Yantra. What is interesting is the fact that a modern 5-story building has no elevators. But you feel no strain in climbing up and down the gentle ramps because of the view around you. There are staircases to go up and down the streets at various levels. A villa block is designed like an embellished jewel box. The cut stone represents the gemstones – again in geometric shapes. The villas interestingly have hues of metals – Gold, Silver & Copper. The private pools look majestic with the latticed windows reflecting in the blue waters. The bathtub is lined with mother of pearl. This is an ode to the gem traders of Jaipur. Whenever I would think of food at Lebua Resort Jaipur I would think of Chef Mahendra Singh Rathore – whose hands have magic. No matter what cuisine he cooks for you – it has taste in it – something not very common in Hotel food. We had all kinds of food by him – right from street food of Rajasthan to its sumptuous Thali to world-class continental food. Each dish of each cuisine had taste as the key ingredient. Rajasthani Thali with a twist had three types of Baatis and two types of Choorma among its 23 items on the Thali. The image of Thali dominated my Twitter Timeline for a good 48 hours with all kinds of envious and hilarious comments. I must mention here the two special dinners they arranged for us. First one was at the Machan – up in a bastion like a pavilion for which you have to go up a ramp. It feels like walking up a triangle. The second one on the rooftop with moon overlooking at one end and the small domes on top of their Vajra restaurant mesmerizing on another. Both the times our tables were lit with lamps and sprinkled with rose petals. You could not ask for a more romantic setting – we all missed our partners while we exchanged stories with our new friends. The smallest meal was a sandwich with a lovely mint melon juice and French fries to go with. We had a tough time finishing this too. The desi in me was happy the day we had Kachori, Jalebi, Puri, Aloo Tikki, Vada Pao, and Samosa for breakfast. Yes, all of this was in one single breakfast. It was when I felt I have touched the soul of Rajasthan. When you check into a luxury property, you expect a certain standard of property and service. However, what makes a good hospitality brand stand out today is the experience they curate for you and the environment they provide. At Lebua Resort Jaipur, every morning we got up to the morning ragas played on the flute. Breakfast at Vajra – the pillared hall overlooking the Aravalli hills relaxes you at once. Spa overlooked the greenery that helps you let go of all the worries while a therapist pampers you. Above all, the staff at Lebua Resort Jaipur always came forward with a smile. Every time we entered the resort, we were welcomed with hand towels, hand sanitizer, water, and my favorite Aam Panna with a broad smile. Staff listened to us without being told. If I said, I am missing Daal Roti, there was Daal Roti in the evening for dinner. We explored many facets of Jaipur and around, stay tuned for the detailed posts on them. Check the latest prices and other details on the resort website. Lebua Lodge is the second property of Lebua group in Jaipur – located right next to the wall of Amber Fort. This is a tented property with no permanent structure although you will find it difficult to believe when you stand there. It is a sprawling 18-acre property in the middle of a forest. All you see around is the white tents and their aesthetic sit outs. 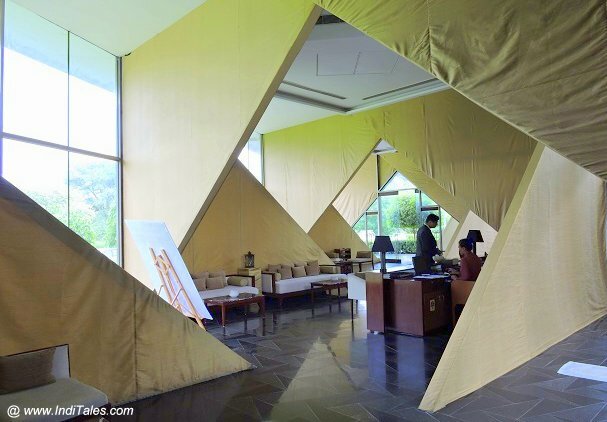 I loved their reception area that again had a brilliant geometric design all done with canvas. The canvas divides the space without disconnecting it. Rooms have all the luxury including bathtubs with a nature view. This time I could not stay at Lebua Lodge, hopefully, there would be another time to explore the birds in and around Lebua Lodge. The designer Pronit Nath of Urban Studio deserves a special mention here for designing these two unconventional yet rooted properties. I am already looking out for other properties designed by them. Thank you Lebua for a wonderful Jaipur experience. Thank you for sharing such a great post about pink ciry. I really enjoyed it and also awesome pic. Glad that you enjoyed the post, Ragini. Stay connected. I have been couple of times, once for my (earlier) company offsite. They had done a stellar job with food, accommodation and all activities. Its great for a weekend trip from ncr. Not visited Lebua Lodge as yet. Shweta, I live their hospitality – the way they pamper you with their ‘Never Say No’ attitude. Lebua lodge is more for adventurous outings and yes a good option for NCR junta who is always looking out for places to spend weekends at. Ditto, could not have asked for more…Thank you for redefining standards in hospitality. I enjoyed your architectural point of view. Ironically I didn’t even realize that there was no elevator in the building, but then we didn’t need it. Our rooms were kind special with the morning view and massive bathroom. That’s the difference between a travel and a food blogger. We tend to see the spaces differently. Yes, our rooms were super special – hope we had more time to enjoy them. Yes, I am being greedy. Looks like a perfect weekend getaway for me.I am already planning my 8th visit to Jaipur and will not be surprised if I check into Lebua.I remember reading about Lena during my research on Thailand.Is it the same chain of hotels? Yes Meenakshi – it is a perfect weekend getaway from your Dilli. Yes, it is the same Lebua – a Thailand based hotel group. The photographs are so mesmerizing. <3 I like the way you have detailed out about your experience. THIS IS SUCH A GORGEOUS RESORT. I HOPE YOU HAD THE BEST TIME THERE. Jemma, it is a gorgeous property. Staff at Lebua Jaipur ensures that you have a good time there, and I assume it is evident in the post. Absolutely stunning! :) I really want to visit sometime:) Thanks for sharing! Yep, stunning is the right word. You must visit them when you visit Jaipur. Geometry is inherent part of Jaipur which is reflected in Jantar Mantar .. seems the resort has crafted the are well .. Right Geometry is inherent in the design of Jaipur and yes Lebua Jaipur takes that tradition forward. I am impressed by these photos! The colors in those rooms are so pretty. They just pop. I would love to stay here one day. Amber, the place is as lovely as the photos. I am sure you would enjoy a stay there. Awesome, beautiful place and resort. i have lived in Jaipur for 6 years and it is very close to my heart. Loved the images and the resort as well. Lucky you Jhilmil. I think Jaipur is one of the most livable cities in India along with Chandigarh and may be Mysore. Looks like an amazing place. I love the Geometry of the building the color rooms look so vibrant. Glad you enjoyed your stay. Keoshia, it’s lovely the way they have mixed the architecture and color of Jaipur in building this resort. You clicked all the pictures so well that they looks fantastic here 🙂 would love to visit soon as i am from Jaipur ! Thank you, Sonali. Do share your thoughts once you have visited Lebua Resort Jaipur. Such a breathtaking place! I cannot believe a five-story building has no elevators but I think it would be unnoticeable with all the pretty scenery around! You are right Courtney, my fellow travelers missed noticing the absence of elevators just because the need was never felt. It is a gorgeous resort. Well, this is definitely a part of the world I haven’t even heard of. But the place looks colorful and nice so, I like it. Well, this is that part of India that most first time visitors to India go to – Jaipur. I wish to visit India someday and also experience this kind of exquisite luxury. Thanks for sharing these deeds. Please do plan a trip to India soon – there is so much to be explored here for any traveller. Thanks for your articles on travel experiences and descriptions. I regularly read all your posts on travel expeditions and have visited few places mentioned in the articles. Prakashan, I do that for places that are not so easy to reach. For obvious places like Jaipur, I guess it is easy to find ways to reach them. Thanks for your feedback, will keep in mind for next posts. Looks like such a beautiful place to visit. I love to see how different cultures live. Beautiful photos. Hey Anuradha, I just read your blog and its really enriching. I like the way you have explained your travel experience. Thanks, Akshat. Wish you all the best with Moode App.